The Academy of Certified Archivists is the only major certification available for professional archivists. I became a member in 2011, after certifying by examination in 2010. The Academy of Certified Archivists exam is a moderately hard test, requiring you to study readings throughout the knowledge domains of archival science. Here’s how the Academy tells you how to study. Spoiler alert, it’s just a really long PDF. My brain needs lists, checklists, and the call numbers for printed items. 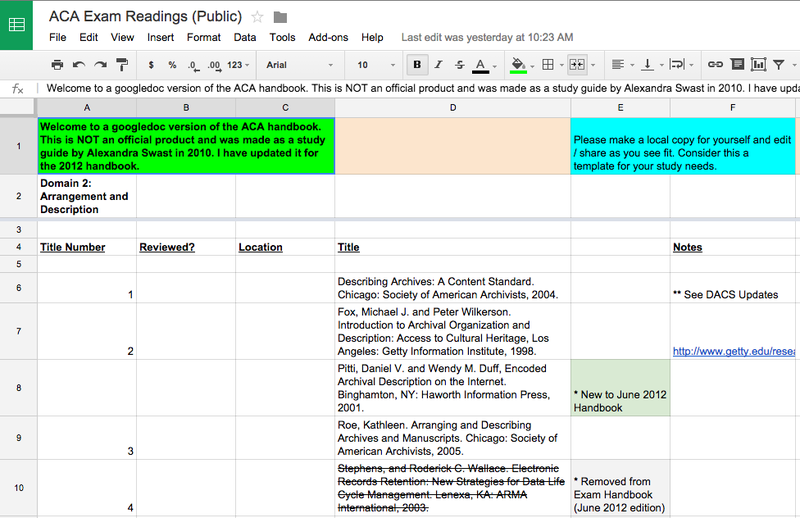 Here is my updated reading list for the exam, as a Google Doc. Please use it as you see best, make a copy, make edits, share an improved version. Attribution to @alexandraswast is always appreciated.